The Icon 1000 Elsinore Boots are straight out of On Any Sunday. A blast from the MX tracks of decades past, the classic five-strap, alloy-buckle chassis, stamped metal heel plate, and internal steel shank combine for a serious dose of moto-x homage. 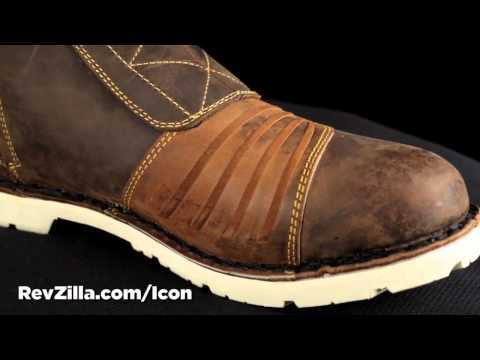 The traditional Goodyear welt construction mates the Icon street-specific sole to the magnificent leather upper. A medial entry zipper, allocated from Paratrooper jump boots, is the only luxury the Elsinore will allow itself. A modern relic from an era when men were iron and tanks were steel. The Elsinore, old-school MX reinterpreted for the urban sprawl. I have slightly wide feet for a woman so I often order men's boots. Was super surprised to find that these are very narrow. Thought I could stretch them out by wearing them around the house but after 5 minutes my foot went numb and I had to take them off. Sent them back, super disappointing. PROBLEM- Black or Brown... get both!! They look great (lots of compliments) and offer solid protection, but if you try to walk more than a couple blocks your blisters will have blisters. Fortunately, I can fit a pair of shoes in my bag when I'm riding and change when I park. That makes these just fine for commuting to the office. But if you're going anywhere where you don't have a place to stash a gigantic pair of boots you should probably wear something else. I got in a crash not soon after I got these boots. Broke my leg. My foot got separated in my boot and I firmly believe these kept my foot from getting ripped off. Plus they are hella comfortable and stood up to the wreck very well. Excellent. Why did they make it brown boots with a white sole? I hate it. Think I'm going to try to dye it a brown color using Rit Dye or something. This is my second set of Elsinore. I really like the black so I wanted to get a brown pair. Got an year and about 10k miles on these boots. I love these boots. I waxed them as soon as I bought them to waterproof them. Leather just isn't waterproof on it's own, no fault of the boot itself. They are extremely comfortable. I find my self using these as just normal boots almost daily. Grocery chopping, working in the shop, mowing grass...I use the heck outta these things and they still look and feel like new. One complaint, though! The area that appears to have an additional patch at the shifter area is a farce. For some unimaginable reason, there's no leather under that patch, so you're still dealing with only 1 layer of leather there. Icon, why even remove the piece of leather that would have naturally been in that area anyway? It's not a fold/crease/comfort area, so just leave it solid? Otherwise, I love these boots. Have ridden in temps as cold as the teens (f) with a pair of wool socks and have been warm. Have also ridden at over 100 degrees and been comfortable, too. Control feel is fine. Traction is good, even when the road is wet. These are not slippery boots. pros- Love these boots, comfort (after break-in) quality craftsmanship and style exactly what I wanted and exactly what I got, could not be happier and RevZilla service was amazing and fast (New Zealand) very happy. Cons- have to break in, shifter pad is a bit far back. Very tough, you can kick steel doors down and won't feel it when you wear those . Perfect on the bike , but not for walking around.